A full schedule awaited the delegates on their second full day of activities at Miss Tourism Queen International 2018 in Thailand. With a 4 am start, which meant only a few hours of rest, the 55 young women proved that beauty queens do not need sleep to look amazing. The first destination of the day for most of the girls was the Phya Thai Palace in Bangkok. Reigning queen, Anu Namshir from Mongolia, and a few delegates paid a courtesy visit to the Minister of Tourism and Sports, Mr. Wirasak Kowsoorad, at the Ministry's headquarters. 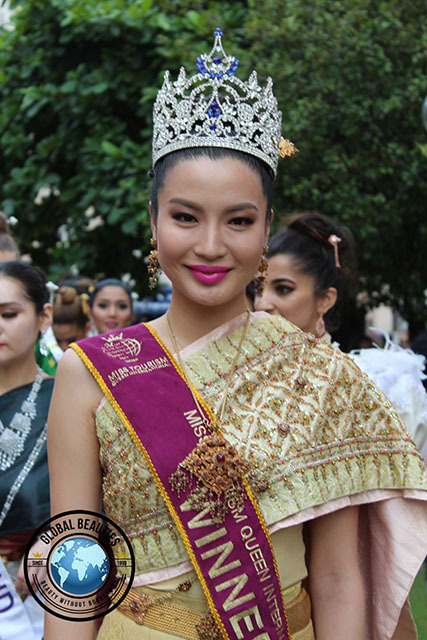 Global Beauties' reporter and photographer, Adi Perkasa, had the honoring of photographing almost all of the delegates in traditional Thai dresses (full album coming soon!) before the group set off to Rayong, 2 hours from Bangkok. 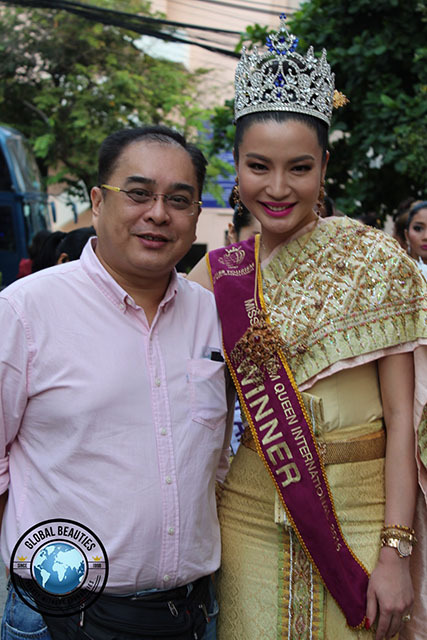 Upon their arrival, the girls headed to Wat Pa Pradu, a well-known temple in Rayong, where a heartwarming welcome by some of the elders awaited the contestants. What’s interesting about this temple is an 11.95-meter left-sided reclining Buddha image (normally a reclining Buddha is right-sided), covered with gold leaves. Miss India, Costa Rica, Thailand, Latvia and Czech Republic were captured by our photographer's lens while they were covering the statue with gold leaves. After that, the group enjoyed a buffet lunch at Star Hotel, which served a complete culinary set of Thailand and also other countries. Miss Japan was delighted with the sushi selection and there was a jovial atmosphere as the young women had the opportunity to meet new friends from around the world. * Miss Belarus came to say hi and send her love to Global Beauties. She remembers us from her participation in Miss Supranational. * Miss Taiwan (ROC), Miss Mexico and Miss South Africa were some the last delegates to arrive and did not have much time to sleep at all but that could did not prevent them from showing a great attitude. * Belgium and Indonesia are delegates to watch out for in this competition. They are always on point with their styling and preparation. * Laos showed her great personality today. She has a great attitude and was lots of fun today but she is also a very accomplished young woman and speaks five languages. She event invited our reporter to visit her should he ever visit Laos - a real tourism ambassador!